The MP series has long been established as a simple but reliable metering principal providing high levels of accuracy & repeatability for a wide range of liquids from extremely viscous lubricants, chemicals & food bases to non-conductive solvents & fuels. Applications include alcohols, acetic acid, caustic soda, ethanol, fuels, grease, glucose, ink, insecticides, latex emulsions, liquid sugar, margarine, mayonnaise, molasses, resin, tallow, urethane, water, xylene & liquid yeast. 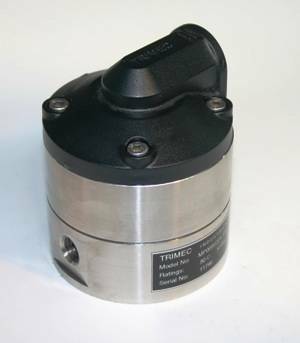 The rotary piston meters are manufactured in line sizes from 10 to 50mm and in a variety of body materials, such as aluminium, stainless steel and UPVC. Standard options include, flanged and hygienic process connections, Explosion proof, integral and remote LCD totaliser-batch totaliser, flow rate totalisers, scaled pulse, 4~20mA & flow alarm outputs, electronic batch controllers and pulse processing modules. Measure low & high viscosity liquids. Has only one moving part (oscillating piston). Certified Exd hazardous area versions in all sizes. No need for flow conditioning (straight pipe run etc).